TODAY's Jeff Rossen explains simple steps to take to make sure your private information on Facebook is safe. TODAY's Jeff Rossen has some tips to make sure apps aren't sharing your private data with the social media network. Worried about your private information on Facebook? You're not alone. 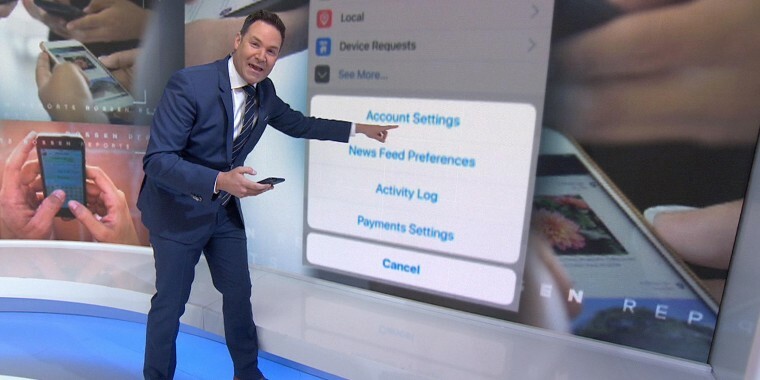 Given this week's Facebook fallout and reports of data breaches, TODAY's Jeff Rossen has some tips to make sure apps aren't sharing your private data with the social media network. When you download a new app, you're often asked to create a new account or log in through Facebook. Facebook is easier, but it's not always the safer option. When you do that, you're giving the app and Facebook both permission to exchange information about you: basic details including your name, the date and time you visited each app, even details about your computer or phone. They can even see whom you’re friends with. Here's how to make sure that doesn't happen: Open the Facebook app on your phone, hit that three line button and and go to “settings,” then click "account settings." Scroll down to "apps," and that's where you can see all the apps that are logged in with your Facebook account. To remove the apps from your Facebook account, scroll to the bottom and click "remove app" for every app. Some people may want to leave Facebook entirely. There are a couple of options to do that: You can deactivate your account through Facebook's website, which is temporary, and means that people will still be able to see you on Facebook. Or, you can delete your account permanently by clicking here. It can take one month to delete your account and three months for all of your information to be deleted, according to Facebook.